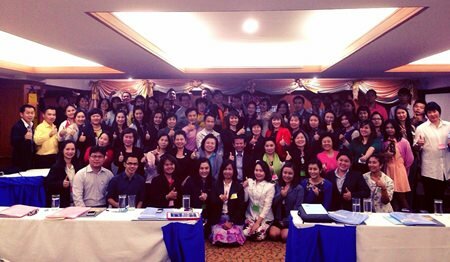 AIA Insurance Agents met at the Chiang Mai Hill Hotel on Sunday, March 02, 2014 to hold a training session for agents and staff to become “AIA Pro-Agents”. Eighty-six agents took part in the training session and expressed their pride in improving their abilities and raising the quality of AIA agents to a high standard. The session was held to ensure that AIA agents were ready for the upcoming AEC integration in 2015. Dirk Weeber of the Podology Center celebrated his 40th birthday at the Imperial Mae Ping Hotel in February 22, 2014 where the party, attended by over 70 guests saw such local luminaries as Chao Dr. Duangduan na Chiang Mai and her son Pakinai, Member of Parliament and owner of Hallo Chiang Mai magazine Nattapimon Chuendong, model Mark Thawin, Dr. Sarawut Srisakun, CEO of the Night Safari and Raya Luelai. Guests were invited to wear fairytale inspired costumes and Sally Golding and Mark Thawin won Best Costumes. Dirk donated 20,000 baht to the Skill Center on the occasion of his birthday. Chiang Mai Governor Wichien Puthiwinyoo attended the Thai Reporter’s Association Awards held at Jia Tong Heng on the Superhighway on Tuesday, March 04, 2014 where he handed out Reporters’ Association awards to leading business people, government officials and members of the media. 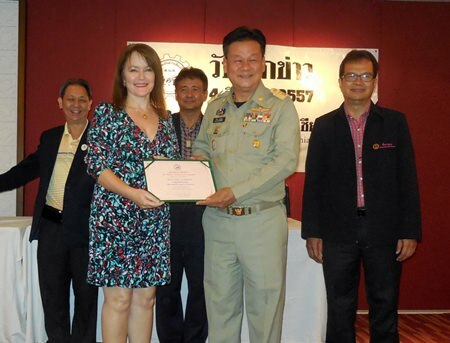 Chiang Mai Mail’s own Managing Editor Shana Kongmun received a Special Recognition Award for Excellence in Reporting in an English language newspaper. 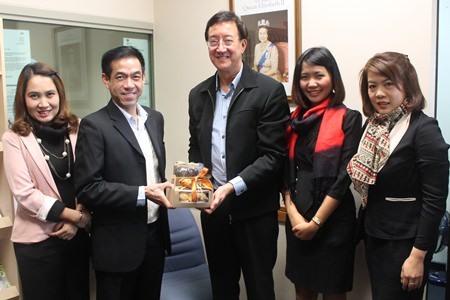 Jerome Sim (2nd left), General Manager of Khum Phaya Resort & Spa, Centara Boutique Collection meets Ben Svasti Thomson (center), Honorary Consul of the United Kingdom in Chiang Mai. 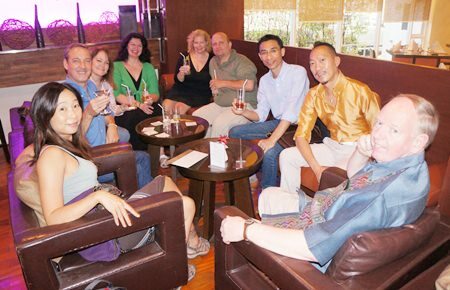 Jerome was introducing the resort, during a meeting held at the United Kingdom Consulate in Chiang Mai. They are seen here with (from left) Warissara Wongsanurug, Kriyatorn Kadsongkram, and Savitee Kantakalung. 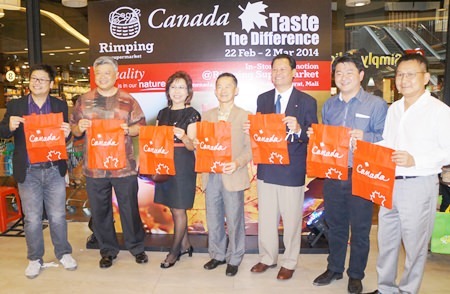 From left: Lorna, Scott, Shana, Nicole, Tracy, Mark, Kittipatt, Sonny and Paul met for the Le Fruit de Mer Food Festival featuring a grilled seafood buffet at Kantary Hills Hotel’s Nimman Grill Restaurant on Thursday, February 20, 2014. 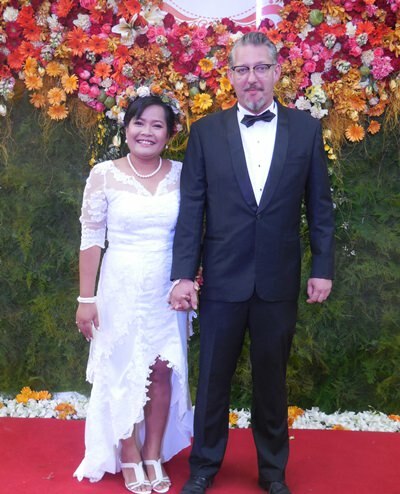 Patinya “Joon” Srisuk and Julio Christian Wuzel Sotelo-Suarez held their wedding reception at Doi Kham Resort’s Tree House Restaurant on February 23, 2014. 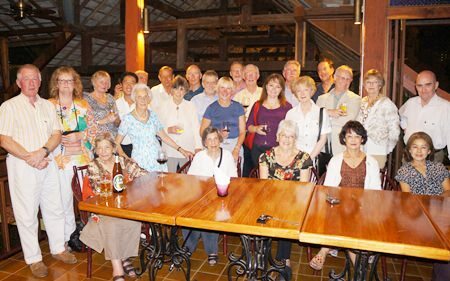 The reception was visited by Chao Dr. Duangduan na Chiang Mai and many other local residents, both Thai and expatriate. 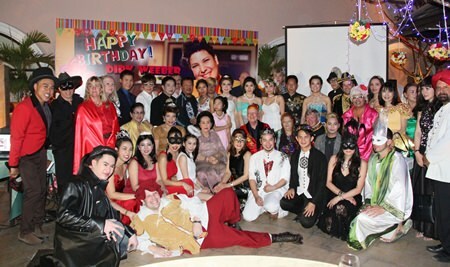 The party featured a flamenco performance by Supreeda “Jeab” Wongsansee, music by Todd Thongdee and others.